Travis Lulay and the BC have yet to fire on all cylinders this season. The Eskimos and Lions engaged in a defensive battle for much of Friday’s contest, but as was the case in Saskatchewan a week earlier, special teams and a costly mistake were contributing factors in the team’s second loss of the season and second in as many games. Here are my thoughts, from the stands. If every BC Lion started the game with the determination that Andrew Harris did last night, the result may have been a lot different. In fact, after some of the plays he had early on, it’s a wonder he didn’t jack his teammates up to his level. Harris refused to be tackled and early on it was clear the game plan was to get him involved to neutralize the Edmonton pass rush. For the most part they were successful, racking up 453 yards in offence against the “league’s best defence”. Harris finished the night with 185 yards, 120 of them through catch and runs. The Lions racked up much of that offence because they were starting deep in their own end much of the night. The Eskimos on the other hand enjoyed numerous starts at midfield thanks to shoddy return coverage and below average punting from Paul McCallum. McCallum has had a shaky start to 2012, and looked visibly frustrated coming off the field at times last night. The Lions didn’t even attempt a 44 yard field goal, in the dome, with the roof closed. That has to tell you something about the confidence that the coach has in his special teams unit right now. I’m not sure what Benevides can do to fix the situation, but it needs to be rectified quickly. With the exception of Harris and Marco Iannuzzi, who is proving he belongs, the Lions didn’t have many other weapons on the night. Geroy Simon and Arland Bruce had four catches between them and that’s just a waste. The Lions are going to have to find ways to get Bruce and Simon more involved, and what has happened to Akeem Foster? This was a guy who looked like he had arrived before injuring his knee last year, and now is almost invisible in the offence. 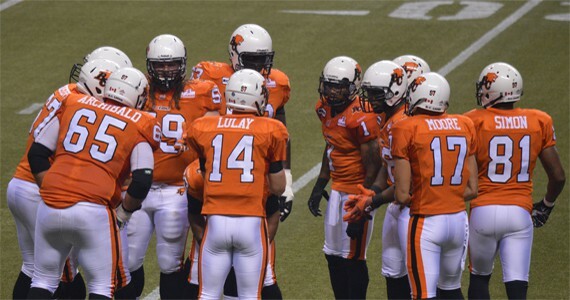 Travis Lulay looked uneasy at times and appeared to lock onto one receiver on numerous occasions. Nick Moore returned to the lineup and showed ok, although he dropped one with no one around him that won’t do him any favours in his bid to make more frequent appearances in the lineup. The defence did their job for the most part. I thought Dante Marsh was having a strong game before he left with another dislocated shoulder. Hopefully he will be ok, and Marsh was telling anyone who would listen after the game that he would be fine. It’s the same shoulder he’s injured in the past. Just two sacks for the defence on the night, and the difference was the two turnovers by the Eskimos defence. The Lions need to get more of those from their defence, especially with the offence not firing on all cylinders. The Eskimos came as advertised. I though Steven Jyles had a pretty good game, connecting on some nice plays before leaving with reported concussion symptoms. Kerry Joseph did his job managing the game the rest of the way. I’m still not sold that the Eskimos can win a Grey Cup with that tandem though. Much like the Lions tried to neutralize the Lions pass rush, the Eskimos did the same with a lot of work for Hugh Charles who finished with 118 yards rushing and another 61 through the air. Their defence is solid, but the Lions did a nice job with the Eskimos front seven, only allowing one sack on the night, although there were many hurries. Right now you have to say the Eskimos are playing the best defence in the league and that unit is definitely winning them games, but it’s not November yet. With the Lions looking to punch it into the end zone to take the lead they chose to pass the ball on first and goal. Lulay tried to force a pass into Geroy Simon a touch late, who had two defenders on him. TJ Hill contacted Simon, the ball deflected into the arms of Joe Burnett who took it back 107 yards for the touchdown that would prove to be the nail in the coffin for the Lions. With the way Andrew Harris was playing it was surprising to see the Lions pass on first and goal. Not only that, but they emptied the back field telegraphing a pass play and Lulay was hurried on the play. That’s the way it has been the last two of games; one mistake, game over. I didn’t see this during the game, so I had to watch it on the PVR. I just don’t see this intent to injure other are seeing. What I am seeing is Rottier having a hold on Mitchell, to the point where it actually looks as though his hand is caught in Mitchell’s pads. To me it looks like Mitchell was just trying to break free of the hold. I’ll call a spade a spade if it’s warranted, but that’s what it looked like to me. Mitchell is an emotional player, and I’ve often wondered if we would see him lose his cool at some point. He may be getting a little frustrated with all the double teams he’s seeing, but I really don’t think there was any “intent” to injure Rottier. On to a tough game in Calgary next week, and as Coach Benevides is fond of saying this Lions team has lots of work to do.